Grilled chicken skewers are good, but we've made them great with a Thai peanut sauce that does double duty as both a marinade and a dip. 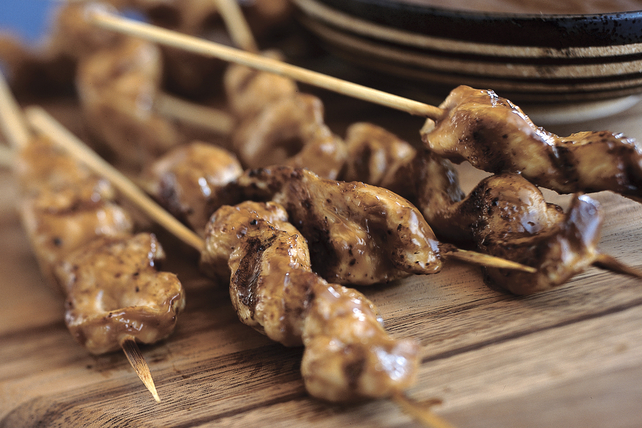 This Thai Satay Skewer recipe is a must-try. Mix all ingredients except chicken until well blended. Add half the sauce to chicken in bowl; toss to coat. Refrigerate 1 hour to marinate. Heat barbecue to medium heat. Drain chicken; discard marinade. Thread chicken onto 16 skewers. Grill 4 min. on each side or until done. Serve with reserved sauce. If using wooden skewers, soak them in water for 30 min. before threading chicken onto them to prevent them from burning on the barbecue. Broil chicken skewers instead of cooking them on the barbecue. Chicken can be marinated up to 24 hours before grilling as directed. Enjoy the flavours of Thai cuisine with these tasty skewers that can be part of a healthful eating plan.